Monday night at Coors Field, the excitement of the Colorado Rockies being in a playoff race will take a backseat. The Rockies have announced that Chad Bettis will start Monday’s game against the Atlanta Braves. For Bettis, it will be his first big league start since surviving two separate bouts of cancer earlier this year. Bettis was originally diagnosed with testicular cancer last November. He underwent surgery and was soon given a clean bill of health. However, after beginning spring training as normal, Bettis suffered a relapse of cancer in March after his cancer spread to his lymph nodes. He made just one start during spring training before receiving his second cancer diagnosis. Bettis was then ruled out indefinitely so he could receive chemotherapy treatments. During his course of chemotherapy, Bettis managed to occasionally summon the strength to throw a baseball. Even amidst a second cancer diagnosis, Bettis always remained determined to return to the big leagues, and do so by the end of the 2017 season. After undergoing his final round of chemotherapy in late May, Bettis was able to focus solely on returning to the Rockies. Over the last month, he has made six minor league rehab appearances. Manager Bud Black and the Rockies are now ready to put him back on a big league mound. In 23.1 innings across six minor league appearances, Bettis posted a 4.23 ERA. He has struck out 17 with opposing batters hitting .275 against him. The numbers don’t look great, but the Rockies are confident that Bettis is ready. 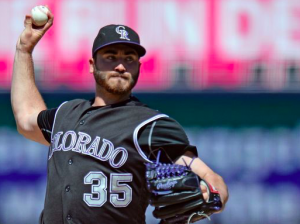 Heading into the season, Bettis was expected to be one of the leaders of Colorado’s rotation. He led the Rockies with 14 wins last season. Also, at 27, he was the oldest member of an otherwise young rotation. Now he’s hoping to complement a collection of young starters who have surpassed expectations this season. For the Rockies, getting Bettis back at all this season can be considered a win and a lift for the entire team. Of course, Bettis is not only returning from cancer, he’s also making his season debut in the middle of a playoff chase. The Rockies began Monday tied with the Diamondbacks for the two wild-card spots in the National League. Their closest competitor, the St. Louis Cardinals, are 4.5 games back. That adds another element to Bettis’ triumphant return from cancer. He admits it may be difficult to focus in what is bound to be an emotional evening at Coors Field Monday night.